Princess Magnolia is having cocoa with a Duchess when the monster alarm rings. She needs to make her excuses fast, get into her ninja outfit, saddle up her unicorn and defeat the monster threat to her kingdom. Will she manage to keep her identity a secret from the nosey Duchess and the clever goat herd? Will she drive the monsters away from her kingdom? It's certainly no tea party being this princess. 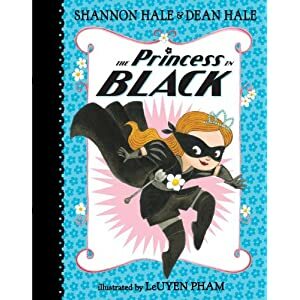 With 15 short chapters and fun friendly illustrations by LeUyen Pham The Princess in Black is great for new readers or for younger children who want to hear a long story. If you've ever wished there was a princess story that didn't start with a pretty dress and end in marriage. Or wished for a superhero story with a strong female character. Then this is the book for you and your kids.